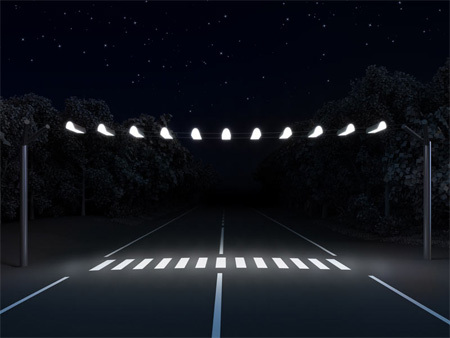 Interesting crosswalk concept, designed by Art Lebedev Studio, promises to increase pedestrian safety by placing illuminated stripes above the road. Increased awareness: Overhead lighting will help drivers quicker notice the pedestrians that are crossing the road. Increased visibility: illuminated crosswalk could be seen from far away, which is especially important for poor lit roads outside the city. The first Air Crosswalk will be installed in Tumen, Russia, where the project was approved by the local police department. The idea is brilliant, but I am afraid that implementing something like this will cost a lot of money/energy. Great concept! Worlds better than that laser crosswalk idea posted a few months ago. 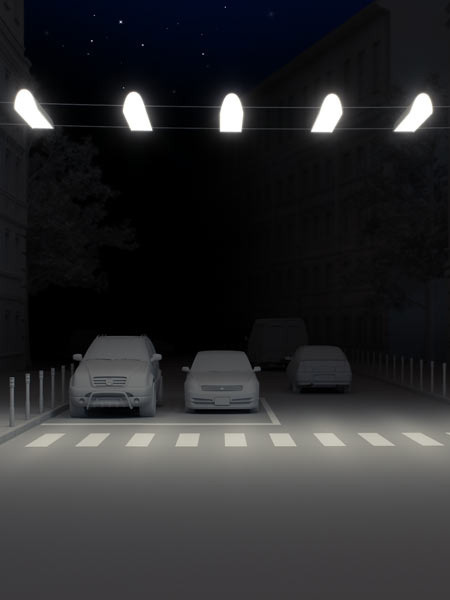 Solar power would be ideal for this concept… allowing it to be installed without the expense of hooking it into the grid. I just can’t imagine this working in cities though, which would be where it would be most useful. The light pollution would be such an issue for nearby residences trying to sleep. I think it will make more distraction to drivers to look up instead than looking ahead. What about daylight hours? I guess pedestrians are on their own when the sun is shining. Oh, and mischievous kids with their stones and late night target practice. Most comments can also be applied on lamp posts.. I think the idea is great. Have to agree with the troubles it might give in cities though, how many crosswalks do you have in the average city? Even so, I would love to see a birds-eye view of the grids of light that these crosswalks would create in the city if they were all lit up at night. Looks nice but I don’t see the advantages towards the existing crossover signs. This only costs energy even when it uses solar energy. I have no clue if the existing crossover signs are a danger for the nature invironment but like I said before, this concept only cost energy and probably a lot of money. However nice example of thinking outside the box. Ok, its a concepts, but wont work in real life. They might be spot lights, but even this wont light like suggested. its an alright idea. i think it probly would help in reducing accidents, but then again, it might not. What about during the day-time? This would be a great idea for mid block crossings if it illuminated when activated. The current blinking lights don’t do to much to grab attention of where the crossing is, just that there is one in the area. The would also be good in rural areas with 40+ MPH speed limits and straight stretches where drivers can sometimes lose attentiveness. I agree that in cities it would just be more road clutter.